Solvit, who's slogan is "No Pet Left Behind", has been helping pets spend more time with their humans by providing high quality products for travel, active life, therapeutic and senior care. 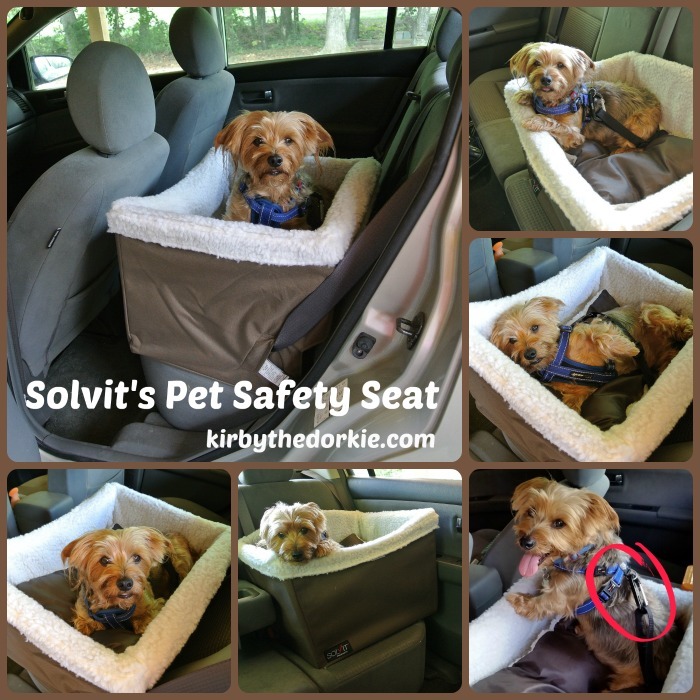 Kirby has literally grown up with Solvit’s pet car seats. They’re easy to install or remove, lets him see out the windows, and gives him his own safe space. In fact, he is five years old now and I’ve never looked for another car seat. Kirby started as a puppy with the Tagalong Pet Booster Seat which is a hanging type basket weighing from 2.5 lbs to 4 lbs that can go in either the front seat or back seat as long as there's a headrest. It comes in three sizes: Medium (14" x 12" x 8") for pets up to 12 lbs; Large (16" x 14" x 8") for pets up to 18 lbs; and Extra Large (20" x 15" x 10") for pets up to 25 lbs, or for two smaller dogs together. The interior liner removes for washing so the seat stays clean and fresh. There's a zippered, storage pocket on the front. It comes with a safety leash and a one year warranty against defects in materials and workmanship. It collapses for easy storage in the trunk when not in use. We used the Large size for over a year until Kirby eventually reached his full size. He could sleep curled up but couldn't stretch out any more. The carbineers on the hanging straps eventually broke under his weight but were easy to replace and he rocked on until we could replace the car seat with a larger one. Once he became too large for the basket type car seat we moved him to the Jumbo On-Seat Booster which was upgraded this year and re-named the Pet Safety Seat™. The inside floor of the basket sits nine inches above the car seat so he can easily see out the windows. It weighs 7 lbs with the outside dimensions being 22” W x 17”T x 17”D. The inside basket dimensions are 18”W x 14”D at bottom, 19.5"W x 14.5"D at top and the sides are 8"T.
It's large enough for Kirby to stretch out on long trips and to share when we have a small foster with us. We often grab the included pillow and use it as a bed for Kirby when we stop to eat at a pet friendly restaurant or in the shopping cart at pet friendly stores. It’s made using Safe-T-Core™ technology, a system of molded plastic panels that fasten together permanently to create a lightweight yet super-strong structure which has been tested to 175 lbs. The best part about this technology is the easy cleanup. We had a little foster in it with Kirby one time who got sick. Once we cleaned up the dogs, all we had to do was remove the car seat, throw the cover in the washing machine, and hose off the plastic base. Easy! The seat installs securely in one minute in either the front seat or back seat using the car's seat belt. I especially like the new adjustable crash-tested safety tether which also integrates with the car seat belt. All you do is pass the seat belt through the holes in the fabric and plastic frame on one side of the seat, then through the large loop on the end of the safety tether, and out the holes on the opposite side and buckle it. The safety tether which has been crash tested to 2,000 lbs can then be adjusted to the desired length. 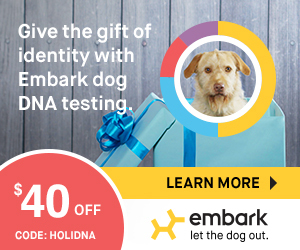 You can also purchase extra tethers if you have two dogs. For safety reasons it's best to use a harness, which Solvit makes, rather than a collar to avoid injury to the neck. We further recommend using a harness for both the car seat and leash - it's quick and easy to hook up from one to the other. Finally, the car seat comes with a Limited Lifetime Warranty to be free from defects in materials or workmanship for the life of the product. 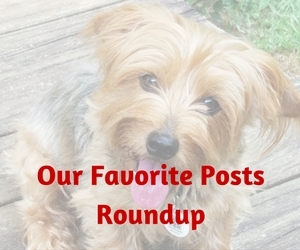 One Winner will receive Solvit’s Pet Safety Seat valued at $75. When does it start and end? The contest starts today and ends at midnight on September 1, 2014. Johnny the Dog - Winner of our Solvit Pet Safety Seat! Disclosure: We have been using Solvit's pet booster seats for five years and received the Pet Safety Seat to review and were not compensated in any other way. Our opinions are solely based on our experience with the product(s) and knowledge of the company which we approve. Solvit is providing the prize to the winner.